The memorial for James Graham Somerville was standing room only. The addresses given chart the life of a man whose persistence and dedication to preserving for all time pristine Australian bushland areas so those to come may stand and stare up at tall trees, or be beside waterways on paths that need not cross roads, were a lifelong invitation to gain respite and joy from all the great outdoors offers. We share these tributes from those who knew him to honour the gentleman and his work, and to keep a record that cannot be diminished by the distance or time from the events spoken of. Good morning everyone and let me welcome you to this occasion when we are celebrating the life of my father James Graham Somerville AM. Thank you to the Mayor of Warringah, Michael Regan for making this venue available. And thank you to the deputy mayor Sue Heins for being here today. Thank you to Nikki Adams, assistant to the Mayor, who has been a great help to me in organising the service. My daughter Jane, and brother-in-law Peter Phillips have been busily scanning and preparing the Powerpoint presentation, thank you to you both. After my father's death on 21 May Rob Stokes, member for Pittwater, wrote an obituary that appeared in the Pittwater Online News. He sent his apologies for today. My cousin Lyn and husband Alan Ford from Bungendore, and my cousins in Bega and Eden. Tom Webster and his wife Maja. Thank you to those who have travelled to join us for this occasion. Helen and Geoff from Hammondville. and Gay and Ian from the central coast. My uncle Stuart, Dad's younger brother, has come from Wyong. Unfortunately Dad's and Stuart's older sister, Margaret, at 102 years old, is unable to join us. 'no-one is interested in me, no-one will come! Well thank you all for proving him wrong. JAMES GRAHAM SOMERVILLE was born in Murwillumbah 99 years ago today. The middle child of James Herbert Somerville and Margaret Pollock. Despite having a minister father in the then Methodist Church, an older sister who became an overseas missionary and younger brother Stuart, who also became a Methodist minister Dad didn't take to formal religion in the same way. The family moved as the ministry dictated every 3-4 years around NSW and Jim attributes these moves to feeling introverted and quiet as a child. His years of schooling ended when he did the Leaving Certificate at Fort Street Boys High in 1933. He described himself as 'an indifferent scholar'. As it was the Depression Dad was unable to find work immediately so he went to the Metropolitan Business College graduating as Dux in 1934. He worked as a bookkeeper during the day and at night studied for some years to qualify as an Accountant and Company Secretary. Right: Jim at 29 years of age. In the late 1930s Jim joined the Coast and Mountain Walkers [CMW], bushwalking club. This was a significant moment, and Jim later described it as a great and welcome revelation to find that other people shared his great love of the bush. At the same time Dad also joined Peace Pledge Union and War Resisters International as he was increasingly leaning towards strong pacifist views. When conscription was introduced in 1939 he was refused registration as a Conscientious Objector. However, at the same time, increasing pressure to sign up was being applied by his father's parishioners. So in 1942, aged 27, he left Sydney and went to North Queensland hoping to avoid embarrassment for his family should he be arrested and possibly imprisoned. Luckily, due to what Jim said was 'bureaucratic ineptitude' he escaped arrest and returned to Sydney where he finally won an appeal to be registered as a Conscientious Objector in 1943. In the same year in June, on a happier personal note, he attended a pacifist weekend at Point Clare near Gosford where he met a charming 21 year old trainee nurse from Bemboka on the far south coast. Her name was Brenda Alcock and she was working at Royal Prince Alfred Hospital at the time. Following a 21 month courtship they married on 23 March 1945. Brenda's mother opposed the marriage as Dad was of course a Conscientious Objector and no family members from Brenda's side attended the wedding ceremony. Brenda was cut out of her mother's will but subsequently reinstated by her brothers and sister. Brenda and Jim enjoyed 52 great years of marriage. I arrived in 1946 and my sister Jan in 1948. We had a very happy upbringing living at Cammeray, Northbridge and Lindfield. On 20 Oct 1947 Dad joined Qantas as Estimates Officer and he stayed with Qantas for 29 years. By the time he retired in 1976 aged 60 he was Financial Projects Manager. During this time he did many economic studies and some of these are in the National Archives. John Gunn who is here today quoted Dad extensively in his history of Qantas, High Corridors. On one occasion Dad did some penetrating analysis of the Department of Civil Aviation. When he found them to be incompetent, he expressed his views in no uncertain terms. The Department of Civil Aviation chief rang the Qantas chief at the time, CO Turner and said to Turner 'get that firebrand Somerville off my back'. This only increased Dad's determination to pursue the matter even more. And this quality of polite persistence he happily wore as a badge of honour. This fighting spirit has seen him lock horns with committees, councils and various people even in his later years. I don't see any members of the Sydney Academy of Sport or Cromer Golf Club here today! Starting in 1957 he travelled extensively for Qantas making 85 overseas trips in 20 years working on various committees. Sometimes these committees fortunately just happened to meet, for example in Europe in Summer or Japan at cherry blossom time. As a family we were able to take great advantage of the generous staff travel concessions that Qantas offered in those days. My sister and I have great memories of meeting Dad on various continents over the years. Jim particularly loved visiting wilderness places such as the snow-capped mountains of the Andes, the European Alps, and the Rockies. He also loved walking the Milford Track and Hollyford trail. In 1968 I walked with Dad 200 km in the Nepalese Himalayas up the Kali Kandaki gorge near Annapurna. In 1971 Dad and I both went to an outlying island of Fiji where we were the island's first tourists. After retirement he did a memorable canoe trip up Glacier Bay in Alaska. Following his retirement Brenda and Jim moved to Narrabeen where he loved all aspects of living by the lagoon – sitting beside it, walking around it and kayaking on it. I was almost tempted to call it Narrabeen Lakes until I remembered the struggle he had to rename it a Lagoon. During Jim's extremely long retirement he was able to devote much of his time to conservation including stopping the remaining rainforest from being logged. This was an 11 year campaign. And he was free to give his Accountancy advice to Tranby, the Aboriginal college in Glebe. His love of the lagoon led in early years to fight against the sand dredging and of course led him later to work hard to see a walkway around the Lagoon. Others will speak in more detail about Jim and the lagoon walkway. A major part of Jim's conservation efforts centred around the Colong Committee which he was involved with for 45 years, starting in 1968 and we will hear about that shortly. In 1986 he was awarded the medal of the Order of Australia the AM for services to conservation. He also served as a commissioner on the State Pollution Control Commission, now the EPA, for 9 years. He wasn't shy about recruiting people to further his causes and I'll leave it to Jill Wran to relate how he angled to get the ear of the then Premier, the late Neville Wran, in a cause he was fighting. In fighting his causes he was a constant and eloquent letter writer and even at the end he fought Australia Post to keep the posting box opened at the end of his street. Family members were encouraged to post any letters we had at the box at the end of Wimbledon Ave. He became a user of the internet and was happy to see his publications freely available on the net. After Brenda's death in 1998 he continued to travel and on his 90th birthday climbed the Harbour Bridge. He usually told people he was 10-15 years younger than he was, and as a testament to his fitness they usually believed him. Dad was very fond of his five grandchildren. They all share memories of being taken on suburban bushwalks where one of the highlights was having a picnic and being told a Naughty Tom story, where poor old Naughty Tom invariably ended up in jail, eating lumpy porridge and cold burnt toast. Dad was delighted with the arrival of two great grandchildren in recent years. The family will certainly miss the pleasure of gathering at Narrabeen on Sunday afternoons to enjoy the peace of the Lagoon and share with Jim the news of the week. Here I would like to pay tribute to my cousin Paul, who over the last 10 years has spent many mutually rewarding weekends with Jim in the house that they both thought was like living in heaven. Paul is very sorry not to be here today. Dad had no respect for mindless authority. One memorable experience made this clear to me when I was 10 years old. I had met him for lunch in the city during one school holiday and as we walked past the Herald-Sun building then at 66 Pitt St Dad said 'let's go in and have a look around'. So in we went, unchallenged, and saw the Editorial, advertising departments, Linotypes, and the huge printing presses spending over an hour roaming around and asking people about their jobs. 'Oh NO' came the stern reply. 'NO NO, if you want to join a tour you have to write in and there is a 6 months waiting list'. Dad politely said 'thank you' and out we went. And I have often embraced this maxim myself, sometimes to the discomfort of my wife. Jim's core values included good living, no alcohol or smoking and plenty of walking. Some here today have commented to me about how hard it was to keep up with him when he hit his stride, even in his later years. Some of you here will be familiar with one of Jim's last hard-fought campaigns. Which was to establish a walkway around the Lagoon. Dad wrote lots of letters, attended meetings and cajoled many here to turn his dream into a reality despite immense opposition from Cromer Golf Club and the Academy of Sport. Despite his protestations about not wanting recognition for this project the Somerville family, who saw how tirelessly he worked, hope that the some aspect of the walk will bear his name. When I earlier read out apologies I purposely did not mention one from Bob Brown who wrote to me with a moving tribute to Jim during this week. "Jim Somerville and companions made the perilous 2,000 feet descent of the Minnamurra River and Falls in 1935 - a feat few others will ever emulate. Nearly 80 years later, Jim was campaigning for the circuit trail of Narrabeen Lagoon - opening an opportunity for everyone to enjoy nature's beauty. 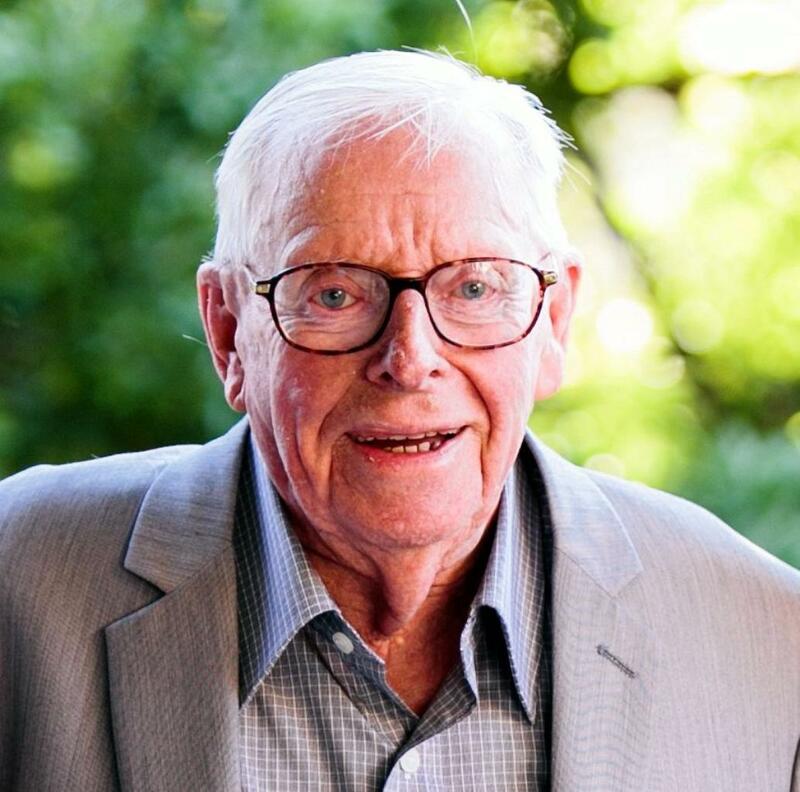 In those eight decades Jim brought optimism, passion and well-informed determination to saving wonderful places, not least the rainforests of the Border Ranges which were threatened with imminent destruction. He played a key role in ensuring that those forests are now securely part of the World Heritage of all humankind. A remarkable friend of our living environment, Jim Somerville has left Australia a more natural, scenic and beautiful nation, forever. We are happily in his debt and, as a bonus, his life provides every one of us ongoing inspiration. Bob Brown. 6 July, 2014. One reason there was no funeral was that Dad donated his body to UTS for research. In case anyone is interested in doing the same there are brochures available for the UTS Body Donation Program. I’d like now to hand over to my sister Jan. It's lovely to be here with you all today to remember the good long life of our wonderful father Jim Somerville. I'd like to thank my brother Lindsay for all he has done to make this gathering possible. There are many of you that we don't know because you were friends or colleagues involved in different facets of our father's life. We look forward to meeting you later when we'll have refreshments. Thanks to the generosity of Warringah's mayor, we are gathering in a place of significance. In 1980 our father and mother moved to Narrabeen to live just over the way (pointing to the window) by the water where the sun sets over bushland. Our parents both achieved their desire to end their days in that serene setting. The mayor may not know that Jim would have objected to the name of this hall where we're gathered: Lake View Hall. As Jim wrote in his little history of the track which we can see below: "Because it is intermittently open to the ocean, it is a true lagoon, not the lake which the Geographical Names Board, despite historical and scientific evidence, wrongly designated it from 1977 to 2009." As you may have guessed, the Board was persuaded to use the term lagoon after many letters from Jim. Now I have a question for you. Would Jim Somerville have been pleased about our gathering here today to praise his many achievements? Well, the answer is No. He was a modest man and would have called this an "ego trip". Now we are here to remember Jim, but first I would like to pay tribute to our mother. After her death in 1998, Jim always kept a flower beside her photo. Since they had held traditional family roles, adjusting to life alone meant that Jim had to quickly learn how to run a house and look after himself. Poignantly, one of the first things my father asked me was how to use a washing machine. Even gardening was new to him, but he took it up with enthusiasm, cultivating native plants and collecting palms. Brenda showed great kindness to friends, family members and even strangers. For example in the 1950's, we had a lot of visitors with unusual names - names like Wolfgang, Ursula, Lieselotte, Angelika, Dorte, Blago and Aranka. We learned that they were refugees from Germany, Hungary, Poland or Czechoslovakia. Our mother welcomed them into our home, helped them adapt to our culture and enjoyed seeing the successes they achieved. Not only was she a kind person and capable housewife, our mother studied child development and so gained more enlightened views about child rearing than were current at the time. Of course she needed these skills because she often had to manage us on her own, with our father so often away for work. Indeed he took many overseas trips while he worked with Qantas, visiting almost every stopover in the network. Jim's tender letters to Brenda from the many places he travelled to for work show how much he relied on her loyal support. When he retired, it was Brenda who guided him as they took an active role as grandparents. Their marvellous childcare meant that I was able to enjoy returning to work. A little anecdote shows Jim's involvement in early learning. While pushing a stroller he would be talking about nature. At one family occasion, my 2 year old Emily pointed to something, so her aunt took the cue and clearly said "tree", whereupon Emily promptly responded "Melaleuca". Now I'm sure you'll understand that the five grandchildren here today will be remembering the warmth, humour, love and support of both Nana and Papa. Left: Brenda and Jim Somerville in 1997. Now I'd like to talk more about our father. As children we learned many valuable lessons and I'll mention those that I think are related to two of his favourite quotations. If a man does not keep pace with his companions, perhaps it is because he hears a different drummer. Let him step to the music which he hears. I'll give two examples of the way our father did not keep pace with his companions. Firstly, as a young man in the 1930's, the music which my father heard was not military marches but Christian hymns. He was a teetotaller Methodist who went to Young Crusader camps. Looking at the many little, black and white photos he took of the groups there, I have a feeling that the girls were actually more of an attraction to him than bible study. As Lindsay has said, he became a Christian pacifist and held to their stated beliefs in the face of widespread opposition. The lesson we took from his determination as a Conscientious Objector was that it's important to think independently and to take a moral stance on political issues. The second example of the way Jim did not keep pace with his companions concerns his first job as a bookkeeper at the Empire Art Company. An American company, it used "hard sell" techniques on vulnerable people. Conduct that would now be called "deceptive and misleading" was standard practice and our father hated it. But he was poor; it was the Depression and he was lucky to have a job at all. The way he dealt with this dilemma was to get out of the city and enjoy nature through bushwalking. He joined the Coast and Mountain Bushwalkers. In his albums you can see happy walkers making the most of long weekends like King Edward VIII's birthday or the King's Jubilee Holiday weekend. The lesson I learned from his example was the healing power of nature. When I was still at school, he showed me how a good hard day's walk in the bush made it easier to tackle stressful things like exams. New ideas are first considered laughable, then objectionable and finally obvious. Jim's new ideas were seen firstly in his work at Qantas and secondly in his voluntary work after retirement. As Lindsay said, when Jim joined Qantas Empire Airways in 1947 he had qualified to be an accountant and he then worked his way up to become Financial Projects Manager in the economics department. He admired his boss of 20 years who described Jim as a "compulsive crusader". During that time staff numbers grew from 2,000 to 13,000 and one of his crusades was to keep staff numbers down. He argued that good profits were achieved in the early years without departments for marketing, security, data processing, industrial relations etc. etc. As we were growing up, our father set a great example of dedication and diligence at work. He was a great reader and showed us that you can undertake study at any time to improve your skills or knowledge. Since he was thrifty and Qantas was generous at that time, he encouraged us to take our free trip every year. From the age of 12, I was lucky enough to travel with him when he went to conferences overseas. Now I'd like to conclude with what I think it was that made our father's life such a long good life. Having a long life is a high priority for many people and one is our former Premier Bob Carr. A few years ago I met him on a USA National Parks tour and he asked after my father. When I reported that he was still physically and mentally active in his nineties, Bob asked: What is his secret? • Having values like independence, diligence, frugality, loyalty and persistence. Thank you Lindsay. I’ve just recently retired as the Chair of the Colong Foundation Committee so this gives an insight into my role here today. Jim Somerville retired from the Board of the Colong Foundation Committee in April 2013. He had been actively involved with the Colong Foundation Committee for 45 years, an amazing contribution to wilderness conservation. He was extraordinarily fit – I’ll always remember after that last meeting how he strode off up Pitt street - he’d caught the bus all the way in from Narrabeen – absolutely incredible. As part of his retirement we were going to have a little ceremony and he insisted on having it at his place and then proceeded to organise the entire event – he was a great decision maker, and of course we all did what were told. I recently followed him into retirement after a total of only 15 years – Jim having rung me out of the blue ten years ago to demand my re-engagement with the foundation in order to introduce young blood to the board. I was a mere girl of 63. Jim’s interest in Nature Conservation began in 1944 when appointed a Trustee of the Heathcote Primitive Area – now Heathcote National Park. Myles Dunphy was secretary. In 1968 Milo Dunphy invited Jim to a meeting of bushwalkers and conservationists at Sydney University which led top the formation of the Colong Committee. Its early campaigns saw the protection of Mount Armour in the Kanangra Wilderness from Limestone mining and the Boyd Plateau from clear felling for pine plantations. Jim had a great way of getting to the right people to win the case. When in London in 1968 he took the trouble to interview the top brass of the Blue Circle Cement Company, whose subsidiary was to quarry the Colong Caves. Whilst he was met with condescension and paternalism by the company’s managers, nevertheless his intervention eventually saw the top brass instruct the Australian mining company to mine elsewhere. I think Jim was mistaken for a member of the New South Wales Government at one meeting, and of course, he didn’t disabuse them. In 1973 I decided if I was to be taken seriously by politicians I needed an education. I went back to school and university in 1974. I dropped out of active involvement in the conservation movement but kept in touch with the issues, noting Jim’s involvement in the strong campaign to protect the Border Ranges, including Grady’s Creek Nature Reserve and Levers Plateau with its magnificent stand of Hoop Pine forest on the New South Wales and Queensland border. Right: Araucaria cunninghamii - hoop pine, courtesy Peter 1968. Jim was, by then, a commissioner on the State Pollution Control Commission and he had much to say at meetings on the need for rainforest conservation. But my closest involvement with Jim was during the Terania Creek Inquiry conducted by the Hon. Simon Isaacs – a judge well known for record making compensation claim payouts for workers. As such he was thought of as a good guy by the then Labour Government. Little did they know that the Inquiry would drag on for three years (22/11/1979 to 22/04/1982). Every submission had to be read, physically, into the transcript of the proceedings – that alone took months and months. I was Project Officer for the Nature Conservation Council at that time and helped coordinate the conservation evidence presented at the Inquiry. Jim’s wok in analysing the economics of the Forestry Commission’s case for logging the giant Brush Box, some dated at 1000 years old, was masterful and his methodology is as sound today as it was in 1979. He demonstrated that the whole project was uneconomic and indeed, cost the state in monetary terms. Jim’s friendship with Jill Wran was also pivotal in convincing the Premier and the government to save New South Wales rainforests. On one notable occasion Jim was able to advise Jill about a segment on the ABC’s The Science Show (November 15th, 1980), prepared by the late science journalist Peter Hunt, which exposed his dramatic bashing, threats made by the Forestry Commissioner, Dr. Wal Gentle, to scientists employed by the National Herbarium pressuring them not to give evidence in support of preserving Terania Creek Forest. These weren't idle threats as Wal was also head of the Public Service Board. Jill turned up the radio at home and Neville heard Wal’s own words – and the die was cast in favour of the rainforest. Jim also had to eat humble pie at the Inquiry as the judge threatened to sue him for defamation for making statements to the Press that were critical of the way the Inquiry was being conducted. But in the end, thanks to the amazing efforts of Jim, Peter Prineas and many others, including the wonderful team up at the forest itself, and a Premier with foresight and understanding, Terania Creek, along with the Border Ranges, Washpool and other New South Wales rainforests now have World Heritage protection. Jim’s contribution was recognized by the late Premier who nominated him for a medal in the Order of Australia for his role in the rainforest campaign. Jim was a most unlikely hero for the conservation movement with a conservative appearance which belied his radicalism, determination and sense of mischief. I have marveled at the sharpness of Jim’s mind at 98 and his energy at pursuing the causes dear to his heart. His is the lead article in the latest Colong Bulletin, a beautiful tribute to the late Hon. Neville Wran, AC QC. Jim has left a remarkable legacy. We mourn his loss but celebrate a long life well lived. Thank you. Firstly I’d like to apologise that Tony Car is not able to be here today – he is leading a fundraising event on the Hawkesbury River, but he has contributed some of the stories I am going to tell. I have a card here which contains the signatures of many people who would like me to convey their condolences to Jim’s family and many express their appreciation of Jim’s life. I first met Jim when we were pulling out weeds on Long Reef headland and we discovered that we were both members of the National Parks Association. Jim would have been well into his 70’s at this stage but he was as fit as a fiddle. Jim has contributed a huge amount to conservation over his lifetime, helping to establish National Parks in Border Ranges of northern New South Wales, being very active in the Colong Foundation and the National Parks Association as well as the Nature Conservation Council. Jim was one of sixty founding investors in a company called ‘Natural Areas Limited’ that intended to purchase properties for transfer to the National Parks and Wildlife Service for inclusion in the National Parks system. This was in the late 1960’s, soon after the National Parks and Wildlife Service was established when there wasn’t much money for buying land to make National Parks. In 1970 this company purchased a property at Cromer that was intended to become a National Park. It has been maintained as a Flora and Fauna Sanctuary for 44 years. As the original investors started to get older, and the property had still not been made into a National Park, Jim made contact with each of them and organized for them to donate their share to the National Parks Association and the land is now protected by a Voluntary Conservation Agreement. One of the sixty investors was Dorothy Butler. Some years ago Jim organized for her book ‘The Barefoot Bushwalker’ to be published. Jim was a keen bushwalker and quite recently he again walked from his place, through the bush, along Deep Creek and up to Mona Vale Road, just to check on the damage being wrought by mountain bike riders. Jim was one of the treasured members of the Friends of Narrabeen Lagoon Catchment. Over many years he has assisted in numerous campaigns committed to protecting natural areas of the Northern Beaches. He was particularly involved with areas around Narrabeen Lagoon and its catchment and must have kept meticulous records of these as he supplied us with dates and details of all the attempts between 1949 and 2004 of all the attempts to establish National Park protection over portions of the catchment. That list is on our website for those who are interested. He had a great sense of humour as many have already attested to. He was keen to get people outdoors and walking and quite recently, aged over 90, he noticed lantana was blocking the way where people needed to walk in order to get around Narrabeen Lagoon. So out he went with his loppers and poison and tackled the problem. The Academy of Sport staff objected to his endeavors and Jim was threatened with trespass. Jim knew exactly where the property borders were so he laughingly stood his ground and asked to be arrested so the facts could be made known. The staff members backed down. He was an active campaigner and letter writer at all times, even very recently. For example, in March of this year he was writing to Brad Hazzard, a Member of Parliament, urging him to support closing the South Creek Road and adding the land between the RSL and the War Veteran’s to the newly formed Narrabeen State Park. But in another letter that he wrote in March of this year, to the Federal and State Environment Ministers, and using very strong language it stated that ‘their actions defied the very principles for which IUCN 2014 Conference in Sydney will be advocating’. His letters were always sharply written with documented evidence to back his position. I wish I still had a copy of one letter he wrote to politicians regarding approvals for Narrabeen Walkway. After reiterating the history, point by point, of agreements that had been reached and subsequently breached, he urged the ministers, quote to; ‘just move the bloody boatshed’ and get the pathway built. At one stage Jim called in some favours form the Ombudsman to organize a meeting between decision makers including the Minister for Sport and Recreation to resolve the situation that was blocking the approval of the walking track. When Jim wrote ‘Narrabeen Lagoon Circuit - A History’ (November 2012) people warned him that he might end up in court because he had named names. When Friends of Narrabeen Lagoon Catchment organised a walk around the lagoon just before it closed for reconstruction Jim turned up to entertain the visitors with funny stories about the people who created all the chaos. He also had no difficulty in keeping up with everyone else on the walk. Jim, we’ll miss you as a person and as a campaigner. We’ll miss your sharp mind and twinkling sense of humour. Thank you for all your contributions over the years. I was in England in Gertrude Jekyll’s garden when Lindsay rang to give me the news. I was so surprised. I suppose I ought not have been given your extraordinary longevity, but only days before you had written me the best letter ever about the loss of Neville. Not log before that you’d been on the warpath again, remonstrating in print about the fact that the tough fight for our National Parks is almost already forgotten. I’m so very sad to think that you won’t reply to this. It’s the end of a great era and there are not more than a few wise men and women, not more than a few, who are still with us today and who went to war, not to destroy, but to save. To save forests and oceans and wilderness and thereby our futures and our souls. It was a time when the very concept of World Heritage was first conceived and then realised, when people worked long into the night making hard choices, and as a result, Australia seemed to lead the world in conservation of the natural environment. Just as it is inconceivable that you’re not here to keep fighting, it’s inconceivable that Australian governments can summarily decide to log the very forests you worked so valiantly to save and which the rest of the world latently realises are so very precious. That an Australian government can take a decision hat will destroy the Barrier Reef whilst another allows not only grazing but shooting for heaven’s sake in our National Parks. It makes me want to turn right back around and go back overseas, turn one’s back on a people who think and vote this way. But Jim, that’s no good; we’ve all got to fight on in your honour and your name. Of course your legacy goes beyond the parks and forests and it has, I might add, used a few trees, albeit largely in chronicling the saving of the forests. Thank heavens you were blessed with exceptional verbal skills alongside the numeracy that gave you a great career in accounting and finance. Thank heaven’s we’ve got your 2005 book as a record of what was most certainly the most important achievement of the Wran government. On the other hand, you sure did a great job for QANTAS, especially representing the company’s interests I key international organisations like ICAO (International Civil Aviation Organisation) and IATA (International Air Transport Association). Looking back over the QANTAS years I honestly can’t remember how we met. It was certainly during my early years in management and your last ones in Chifley Square. I must admit remembering asking you questions about pricing and route economics – I wish I could ask you many more questions now Jim… and I know you would answer truthfully, with characteristic modesty and an inherent faith in man’s capacity to ultimately see green. Dear Jim, I can see you now coming down that corridor on the sixth floor of QANTAS House, your easy and brisk walk, head on one side, smiling mischievously, a soft satchel of green sort of papers under one arm. You were always gentle, but with such a ready wit and unforced charm. It was always a joy to see you and hear the latest regarding the issues at stake. Our talk was not confined to parks and wilderness as we soon discovered we had a pretty strict Methodist upbringing in common – as well as us both being advocates for Aboriginal Land Rights. In fact, didn’t you something to do with Aboriginal education? One thing I do want you to be clear about Jim is that it was you, and yes Milo Dunphy, but mostly you who saved the rainforests of the Border Ranges and ultimately brought about the dedication of some one hundred and eighteen thousand hectares of State Forests in New South Wales as National Parks. It was not Neville, or Jill Wran. Yes, I wanted it too, very badly – but it was you who guided and informed my deep-seated passion for guarding the natural world. It was you who encouraged me to join the fight of the conservation movement in every way open to me. It was you who did more to bring Neville around to the cause than any other single individual. To those gathered: In fact; I actually got Neville into the car to listen to that radio interview as otherwise I didn’t think I could keep him sitting still. I know it was ten long years and we’re inclined to forget, as you say, just how powerful the Forestry Commission was at that time, not to mention the sawmill industry, and Neville had a very conservative cabinet with two northern New South Wales members Lin Gordon and Don Day, both in marginal seats and determined supporters of logging. Now there’s going to be a World Park Congress in Sydney in September and one of your last wishes was that at this we should honour the work done by Milo Dunphy, The Colong Committee, the Total Environment Centre and their many supporters in the 1960s and ‘70’s, and to the political actions of Neville in the 1980’s and Bob Carr in the 1990’s. You wrote a wonderful article and I’m going to do what I can to make sure it’s published in the way that you had in mind. Meanwhile, it’s great news that your persistence has won out again and the walking track around Narrabeen Lagoon will open later this year. I do hope there is a bridge named after you, as has been mooted, as no one was better at burning them. During the Border Ranges campaign I know you worked tirelessly to bring onside groups like The National Estate, The National Trust and all the other conservation societies, and I seem to recall that straight after the resolution of the Terania Creek Forest dispute in 1982 you went right around to the Forestry Commission to mend fences, and, as you said, hopefully dampen down future confrontations. “But Jill,” you said, “there are still some logs at 99 York Street not yet harvested.” (Laughs). What a great citizen you’ve been Jim – of Warringah, and the world. I well remember you writing to tell me in the mid 1980’s that you were hoping to work through UN agencies to shame the Japanese to be more responsible in their rainforest logging in southeast Asia. There was just no end to your energy and reformist zeal. In the progression of life one meets only a handful of truly genuine and generous natured people. This little missive, above all, is simply to say how very glad that I am that we’ve been friends. When we met my life was forever changed in uncountable good ways and I will always regard it as a privilege to have been nourished by Jim Somerville’s unique store of knowledge, human decency, good humour and humility. I met Jim (James Graham) Somerville in the 1970s. I was then at the start of my working life and Jim was approaching the end of his. We were members of the Colong Committee. Jim had been there for the successful campaign to stop limestone mining at Mount Armour and the Colong Caves in the 1960s. I had joined some years after when the big issues were saving Lake Pedder from the Tasmanian Hydro-Electric Commission and stopping the NSW Forestry Commission from clearing the native forest of the Boyd Plateau for a vast pine plantation (Pedder was lost but we won the Boyd fight). When Jim Somerville returned to an active role in the Committee about 1974 I hardly gave him a second look. He didn't look like a militant anything. where the rest of us didn't go. He met and talked to people that Milo would have scared away. With his intellect and gentle persistence Jim achieved much. I noticed that Milo deferred to Jim in many things and I had to revise my initial impressions when one day I went to Jim's place of work to collect some papers. The large and well-situated office he occupied in the Qantas building in Chifley Square flagged him as an important man. Although his responsibilities at Qantas had been considerable, Jim was a relaxed and genial character. He was always ready to laugh. In fact he liked a bit of mischief. I remember the delight he took in recounting a phone call where he passed himself off as someone else in order to confound the 'enemy'. After I was appointed Executive Officer of the National Parks Association in 1974, I worked with Jim on many issues and our friendship grew. I recall going with Jim and Milo to talk to Neville Wran. It was our first meeting with the then Opposition Leader and it took place at his Parliament House office. When we were ushered in I remember thinking it was a very small room. It seemed just big enough for a desk and few chairs. Miraculously, Neville Wran managed to make a highly theatrical entry from the back. Even more unexpected was his friendly manner and his interest in our concerns. It was clear from the discussion afterwards that Jim and Milo expected a lot from a future Wran Government, and they would not be disappointed. Wran would soon marry Jill Hickson, a colleague of Jim's at Qantas; this would prove to be valuable connection. Sydney, now Heathcote National Park. He served on the Trust alongside Milo's father, Myles Dunphy. In 1968 Jim attended the inaugural meeting of the Colong Committee, formed to stop a subsidiary of the world's largest cement company, Blue Circle, from quarrying 50 million tons of limestone in the southern Blue Mountains. The Committee won that argument after a seven-year struggle. As mentioned, it then went on to scuttle the NSW Forestry Commission's plans on the Boyd Plateau. National Parks Association. It was while working with Jim on the rainforests that I got to know him well. I need not say a lot about this period as Jim has left us his account entitled 'Saving the Rainforest'. It runs to more than 170 pages, although characteristically he underrates his own contribution. He made significant contributions to saving rainforest areas at Levers Plateau and Gradys Creek in the Border Ranges and at Terania Creek. In addition to the Colong Committee, Jim gave other environmental groups the benefit of his time and expertise over long periods, notably the National Parks Association and the Nature Conservation Council. Around the mid 1980s Jim organised a group of residents at Narrabeen to stop the dredging operations then occurring in the Lagoon. I had a law practice and Jim brought his group to me. I ran a five–day case for them in the Land and Environment Court before the Chief Judge, 'Diamond Jim' McClelland. We called expert evidence to show that although the Lagoon was shallow it did not need dredging to remain usable by recreation craft. Contrary to general wisdom, little of the sand on the bottom was put there by erosion of the surrounding hills; it had come from the sea, deposited in an earlier era when the sea level was higher. Jim Somerville and his group won their case and the dredging stopped, although I don't think the judge put much weight on the scientific evidence I took such pains to present. effort sufficiently through his service in the Auditor-General's Department and ordered that he be registered for non-combatant duties. Jim Somerville continued to apply gentle but persistent pressure on the powers–that–be right up to the end of his life. One of the last issues he ran with (but not the last) was the completion of the Narrabeen Lagoon Track. served on the Board of the State Pollution Control Commission (the predecessor to the EPA), where he mostly pursued nature conservation issues and particularly those involving forests. One of the reforms to which he contributed was the introduction of tighter regulations on logging of steep slopes. In his letter to me, written in his clear and steady hand, Jim mentioned that the EPA was now backsliding on this issue. Stopping this, he said, would be his "last campaign”. Speaking for Tom Webster (who just could not be with us today) and myself, we had a really close friendship with Jim. Think of any fine adjective to describe Jim, brave, strong, kindly, energetic, committed, intelligent and so on - he fits them all. Jim was one of those who was unswerving in his lifelong commitment to the cause of environmental protection. He carefully assessed the issues and was never afraid to speak boldly. As we have heard today, he was a true champion in the campaigns to protect the Border Ranges, Levers Plateau, Grady’s Creek and the Colong. The victories required the intelligent co-operative effort of Jim and like minded people--- inspired leadership, and at times a certain spark of genius. These people clearly understood the enormous, irreplaceable value of these ecological systems. The years of the Wran, Carr and Unsworth governments produced the peculiar eclectic mix of people, politics and power and responsive government that produced important new National Parks. In retirement, or should I say later years, because right until the very end he never retired from the battle, Jim had turned his attention to local issues. He had been an enthusiastic member of the old Narrabeen Lagoon Committee and its replacement - the Narrabeen Lagoon Catchment Committee, as he was also of the Stony Range Flora and Fauna Reserve. He lived independently till the last and enjoyed Chess on Tuesdays and the Probus Club. He was of huge assistance to me personally in the formation and operation of the Save Jamieson Park Committee. Together we researched the archives into development approvals of astonishing unplanned growth of the adjoining retirement village, that grows like topsy on the ridge above the lagoon, sometimes at cost to the beauty and value of Jamieson Park. Jim and I gave evidence in four Land and Environment Court hearings over this or that overblown village project. While we did not always win - still we had some notable successes in defeating attempts by the village to shove the lagoon track off the Wheeler land and to excavate an ugly, destructive road cutting down the escarpment. In recent times the track, currently known as the Narrabeen Lagoon Multi Track, drew most of his energies and attention. When completed it will stand as a monument to Jim for there is not a shadow of doubt that but for his dogged determination it was not going to happen. I think it should be named the Somerville Track. He made his mark in so many areas. For example the green fence recently erected on Narrabeen Bridge to protect pedestrians is purely down to Jim. His initiative and his alone. When you look on it think of him. Narrabeen Bridge - Showing Green Fence. There are two Jim campaigns still awaiting fruition. The completion of the track and the closure of unmade section of South Creek Rd and its incorporation into Jamieson Park. We could do with some shove on that one. Jim Somerville was kindly, well mannered, nearly always polite. There was a touch of Don Quixote about him, but he who could always see humour in things, a ready and infectious chuckle was never far away with Jim. A very human man, loved by many, he was truly an inspiration. I speak on behalf of the volunteers of Stony Range Regional Botanic Garden. Jim will be sadly missed by us, his friends. A gentle man, kind, passionate about the environment and its preservation. We really can’t remember exactly when Jim joined us back in the 1980’s. He was Honorary Treasurer and served in that capacity for many years. Jim was also a voluntary worker in the Reserve a week before his passing. Jim and I had our mutual interests in Nepal, a country he had visited many times trekking in the early days. Some years ago he gave me a book entitled ‘Annapurna: The First Conquest of an 8,000-Meter Peak’ written by Maurice Herzog in 1950. He was a man of action and for him, life was an adventure. We are reminded that immortality lies not in the things you leave behind but in the people your life has touched, and Jim’s life touched many people. Jim Somerville was a man for all seasons. This man, who contributed so much to his country and fitted so much into a lifetime of service, that those of a younger generation will find hard to emulate. His spirit is surrounded by the bushland he loved. Thank you, it is truly an honour to be here today to pay tribute to Jim. We have already heard so much about Jim’s life and achievements today. I’d like to tell you a few anecdotes. I think I met Jim in 1979 during the Terania Rainforest battle. I say ‘I think’ because he was such an unobtrusive character that you gradually became aware of his influence on you. at that time I was a newly minted MP, the Member for Manly, along with my friend and colleague Tom Webster, who was the Member for Wakehurst, and we were learning the ropes on all sorts of things. I had some training in Biology so I pretended perhaps that I knew something about rainforests. So I got involved in a fairly early stage in a Parliamentary battle. This was a turbulent time, when long haired hippies confronted bulldozers driven by timber workers who were worried about losing their jobs. Many of the protestors were arrested by a large contingent of police – among the protestors arrested was the Prime Minister’s daughter – Rosslyn Hawke! This brought a lot of publicity and the battle was followed by many on the evening news on television. As the conflict continued various personalities came to the fore. These included the flamboyant Milo Dunphy, one of the leaders of the conservationists, Barry Unsworth the then formidable union leader who eventually became Premier and was obviously on the side of the timber workers. There were prominent scientists involved, who did know something about rainforests, and they included Len Webb (Professor Len Webb AO: Professor of Rainforest Ecology and Officer of the General Order of Australia) who was an international authority on rainforests, and Dr. Harry Recher who was at that time a scientist at the Australian Museum and a public servant but was not afraid to speak out quite fearlessly. We also have to consider how Neville Wran got involved – Cabinet was split, and so was Caucus, but Neville announced an Inquiry would be held to, led by a retired Supreme Court Judge., the Hon. Simon Isaacs QC. Jim Somerville had been working doggedly behind the scenes gathering facts and lobbying officials. He seemed the very model of a retired accountant; conservatively dressed, softly spoken and mild mannered. But underneath this persona was a dedicated conservationist who had been involved with numerous causes, many of which we’ve heard about today, over many years. He had the ear of many politicians and bureaucrats. He was the greenie’s secret weapon. At the Inquiry Jim gave evidence o behalf of the Conservation Movement. They were shocked by the harsh treatment they received from a judge who didn’t seem to understand the technical issues involved. When the Hon. Isaacs handed down his Report he recommended that logging of Terania should continue. This caused widespread outrage, not only among conservationists and scientists but more importantly in fact, the electorate at large. In due course The Report of the Terania Creek Inquiry (1982) was shelved and a New South Wales Government Rainforest Policy (1982) and eventually a World Heritage listing protected this priceless asset. Neville Wran said that saving the rainforest was the one achievement for which he would be remembered. This year I was in Denali National Park, In Alaska, when Tom Webster sent a message telling me that Jim had died in his sleep. Denali had become a special place for Jim shortly after he left QANTAS in 1976. On returning home from Alaska I found a large pile of mail waiting on my desk. An envelope caught my eye – it was addressed in a familiar hand. Inside was a letter from Jim Somerville asking for my support in lobbying the present State Government to prevent logging of native forests. It was dated May 4th, 2014 – he had fought the battle right until the end. Now Jim, I don’t know how I’m going to reply to this letter, I will have to give that a lot of thought, and I’m sure we will all continue to support your struggle – you have set such a great example. Thank you. Thank you for the opportunity of speaking here today – I am here representing my parents Maja and Tom Webster. Dad first met Jim when he was fighting to save the rainforest in northern New South Wales. As many here have already said, Jim’s itemised facts, his research skills, his eloquence were critical in winning a lot of these campaigns. I remember mum and dad telling me when younger when they were pushing through these National Parks that one of the reasons the fight was so passionate was due to enlightened people like Jim who wanted to protect these areas from mining for future generations. In speaking of this yesterday and it seemed, in our view, odd that the vision of government was seeing their role as preserving pristine areas for future generations has gone. It seems now that the fights of the 1970’s and 1980’s are gone and we even have a government pressing UNSECO to remove areas from World Heritage listing and state governments that are allowing shooting and logging in National Parks. I was fortunate to hear Jim on several occasions wax lyrical about his adventures bushwalking and bicycling – so it’s great to see him in photographs here doing just that. A particularly fond memory of mine is his telling of his walks along the Oberon Track in the early 1940’s – this inspired myself and my mum and dad to go and do that a few years ago and share photos and stories of that wonderful part of the world. As a beneficiary of Jim’s foresight and commitment I’d like to thank him on behalf of my generation. He certainly wasn’t a half-hearted greenie, he gave it everything he had. Our family members are privileged to have known him and to have been a part f his life. Thank you. We have heard a lot today about Jim’s achievements and voluntary work. It may please you to know that he still found time for a bit of relaxation and socialising. It may have been this that in 1985 drove him to join the Pittwater Men’s Probus Club. We meet in the lovely Mona Vale Golf Club, overlooking the sea. This year he was our most senior member. He enjoyed the company of our diverse membership and undertook a variety of roles during that time. He was the club’s auditor, which you would expect with a man of his background, a role he undertook for the last nine years. He also recently gave us a full presentation on the importance of the Narrabeen Lagoon and the Northern Beaches environment which inspired a lot of the people there that day. His knowledge of local history was phenomenal and enthusiasm on local environment issues motivated all of us at the club. At our coffee breaks, which don’t seem quite the same without Jim there, he’d always bring up some topic and get everyone involved in discussing many local issues. The club members would like to record here today not only the contribution Jim made to the conservation movement but to the people at Probus and acknowledge his contribution to the life to the club. We’ll miss his wit and leadership. It has been a privilege to have Jim as a member of our club. Thank you very much. At this stage Lindsay Somerville invited those attending who wished to say a few words to do so. I got to know Jim fairly late but would like to share this story with you as it is so Jim. In 2010 I put on a save the old growth forest fundraiser and one of the first bookings was by a ‘Jim Somerville’. A little later we did another event and once again one of the first bookings was by a ‘Jim Somerville’. Well, that continued and I became a bit mystified; ‘who is this person? They have the same ideas as mine’. There was always a letter with the booking, and it was always very straight writing, and for some reason I imagined a 29 year old very fit person on a pushbike, someone very interested in conservation but very straight forward. It was amazing when I finally met Jim at a function to raise funds towards saving the River Red Gums, to find him very like what I first imagined, just older. I have since spent quite a few afternoons in his home overlooking Narrabeen Lagoon, where I would receive a set of instructions about writing a letter about a reserve, and he had written it out, what I had to write – and I sent a copy back to him saying ‘I did my job’ – he taught me to keep copies of what and how many people sent letters about an environment issue. Jim was my first contact with the conservation movement when I started the Environment columns for the Herald in 1975. He sent me material about the proposed logging of the Border Ranges, about the are on the Queensland border but particularly about Levers Plateau and Grady’s Creek. I wrote a story that said the last remnants of rainforest are threatened by logging. That began a long association with Jim and the conservation movement right through the 1980’s which culminated in the saving of Terania Creek by Neville Wran in the ‘80’s, urged on by his wife Jill and Jim Somerville, who won support in Cabinet for the preservation of the rainforests. Then we had this wonderful area of rainforest acknowledge by the United Nations as one of the greatest areas of preserved rainforest in the world. We owe a great debt to Jim for all his work in that long battle. When Neville rang after that last election he told me this was his greatest achievement in politics; that many of the other things he had done would be forgotten but that the rainforest would last forever. Jim was a great conservationist and a true gentleman. Joseph Glascott was the first Environment Writer for the Sydney Morning Herald. He wrote thousands of articles about town planning, air and water pollution control as well as reporting on battles to save the NSW rainforests, Tasmania’s Franklin Dam and Queensland’s Daintree rainforest. He is still considered by many to be the preeminent environment journalist on environmental issues in Australia. Jim was telling us about the bushland he was cutting, and I think he was about 96 at this time, and was hacking a path through the bush when approached by two rangers who said to him ‘what are you doing?! You can’t cut natural bush – don’t you know that?’ to which he replied, ‘excuse me, it’s a noxious weed, it’s lantana’. That is something you can see Jim doing. The other insight I’d like to share is about when Jim wrote Narrabeen Lagoon Circuit – A History. He asked me, an author of 72 books, a teacher and librarian, to have a look at it and give it an edit. Well, we had the rounds in the kitchen, I wasn’t getting away with anything and for most of my suggestions he had a very good reason why he wasn’t going to be listening to them. He knew what he wanted to say and was so eloquent his message tells the story about getting that path around the lagoon. If you read that work you will see the measure of the man – but the thing you don’t see, and which we’re all going to miss, is his smile. I met Jim only in the last year but I want to thank him on behalf of the Chess Club. He was the heat and soul of it. We really have a problem, we are missing him very very much, so I wanted to thank him very much on behalf of all of us for his kindnesses and the joy he brought to our group. I would like to thank Jim on behalf of all the people he encouraged in their careers in conservation. I first met Jim when I wrote a thesis back in 1978 on the Border Ranges dispute and of course was immediately put on to Jim by Milo and wrote that really wonderful story of that first battle, often forgotten, amongst the more dramatic and mediatised battles near Terania Creek. It has already been said beautifully and eloquently today in some of the most wonderful speeches I’ve ever heard, well deserved by their recipient. What I wanted to do was thank Jim for being an encourager of my career and looking around this room here today, I see many others he has also encouraged. Thank you. Encourage: ‘to put heart into – from en; to place in/within + cors : ‘heart’ From EN ‘in, within’ from Latin; in. Prefix forming verbs. Nouns; put in or on, go on or into. Adjectives and Nouns; cause to be in a certain state or condition. + COURAGE from Old French; corage, from cuer; ‘heart’, from Latin; cor ‘heart’. The quality or power of dealing with fear, pain, danger. Obselete; ‘mind, disposition, spirit’. I would like to acknowledge the friendship and inspiration of Jim to our family. Jim was one of my father’s best friends. They met through Conscientious Objection during the second world war and maintained a long and continuous friendship. We were kept appraised of the latest conservation battle and followed all the instructions Jim gave. It’s something that has never left me and never will. That inspiration has kept me going and has kept our family going and I’d just like to thank the Somerville family for their friendship because that is something very special in this day and age – that continuity. Jim has been part of my life for well over 50 years, an incredible thing. To close; My son visited Jim who gave him various bits and pieces of camping gear equipment that he couldn’t offload to anyone else and this is something that my son is still using for bushwalks. So this too is something that continues, and I think there is a lot more to be done yet - thank you. I was fortunate to meet Jim was I was an Principal Solicitor at the Environment Defenders Office in the late 1980’s and early 1990’s. One of the great privileges of being a solicitor in this office was the clients I had and getting to meet people like Jim, who was outstanding as a client of that office. He was always very enthusiastic about litigation and his great intellect really shone through in the interactions he had with the solicitors and people of the office. What I really like most about him was his sense of humour, which was really important at that time as some of the litigation we were involved in was quite difficult to deal with. Thank you. Enthusiasm: from ENTHEOS ‘inspired, filled with God’ from Greek; from en ‘in, within’ from Latin; in. Prefix forming verbs. Nouns; put in or on, go on or into. Adjectives and Nouns; cause to be in a certain state or condition. + theos ‘god’. From Greek; enthousiazein; ‘to be possessed by a god’. Translates as ‘enthusiasm’ into English. Filled with God. Ardent. Lively interest or eagerness. I could say a lot as I’ve known Jim a long time but a lot has already been said. I first met Jim when I was on the Nature Conservation Council and there was a lot of very impressive people there – Milo Dunphy and Roger Cowan among them, a lot of people who are no longer here. And there was one guy whom I didn’t quite know what he did, he didn’t say a lot. He turned out to be Jim. When he moved to Narrabeen we got in touch again and have been friends ever since. About four or five weeks ago he called into my place after he’d done his volunteer work at Stony Range – which he did every Tuesday – and he had a big smile on his face. I asked if he’d won the lottery or something and he said ‘no, I’ve just had a letter from the DMR and I don’t have to get another driving licence for another five years! I’m 98 now so I’ll be 103 then!’. We used to meet sometimes in the street and have a bit of a joke; I’d say to him, ‘Jim, when you’re gone, I’m getting it changed back to ‘Lake’.’ He told me he’d be around for quite a while. I helped him a little bit with the fence on the Narrabeen bridge which we wanted installed as a safety measure so people walking all the way around the walkway, once complete, would have a barrier between then and the traffic when on that part. I recall thinking recently when passing over Tom Ugly’s bridge that that’s what it’s name is – if you are named ‘Ugly’ then that’s the way it is. But when I think of what was said earlier, ‘the Somerville Track’ – this has a nice sound to it. I’d like to think that we, as a group here, can help this become the Somerville Track that will be an achievement for all of us. "There will be a bridge right there!" - Jim Somerville - Image courtesy Tony Carr. 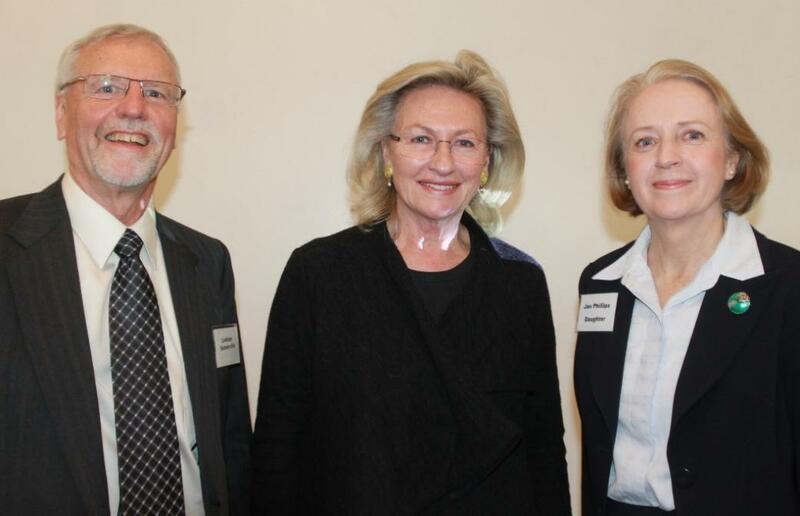 Lindsay Somerville (son) with Jill Wran and Jan Phillips (daughter) - picture by A J Guesdon, 2014. Judge Clancy, in the District Court yesterday, heard applications by conscientious objectors. Conditional registration was granted to William Ian Short, aged 31, a solicitor, practicing in Burwood Short said he had been a Sunday school teacher and was a member of the Peace Pledge Union. He objected to non-combatant work, because it assisted the war effort, but was willing to do forestry work which he regarded as purely civilian work. James Graham Somerville, aged 27, auditor, employed in the Commonwealth Auditor-General's office, said he was employed at present in the Munitions Department at £9 a week. He had signed the pledge of the Peace Pledge Union, and was secretary of the Pacifists' Aid Council. He did not agree that the Army was helping to save his life. If the Japanese came here, he would adopt non-co-operation methods, such as Gandhi was adopting in India. If he engaged in forestry work, he did not think he would be assisting the war effort. The annual report of Qantas Empire Airways Ltd. shows a magnificent record for 1936-37-2,248,298 - passenger miles were flown on the Brisbane-Singapore service alone, compared, with 1,047,556in the previous 12 months. The amount of mails and freight, increased in- a similar ratio. Despite this increase, and the extra organisation necessary, no accidents to passengers or staff occurred. This service Is truly international in character, and carried representatives of 26 different nations. Included in the passenger list are the names of such well-known people as Lady Louis Mountbatten. Lord Balfour of Burleigh, His Excellency the Governor of Queensland (Sir Leslie Wilson) and Lady Wilson, the Premier of Queensland (Mr. Forgan Smith), Sir Geoffrey and Lady Whiskhard, Lady Somers, Lady Haig, Sir Keith Smith, Mr. Noel Coward, and Mr. Charles Chaplin. Qantas Empire Airways also provides the ambulance plane and pilot for the Aerial Medical Service of the Australian Inland Mission at Cloncurry, and last year this entailed a total of 32,444 flying miles. Altogether, in maintaining the Brisbane-Singapore, Cloncurry-Normanton, and Longreach-Rockhampton air route services, the aerial medical service, air taxi, and special charter flights, the company's aircraft- flew a total of993,277 miles in the year 1936-37. At Garawarra yesterday afternoon, the honorary secretary of the New South Wales Federation of Bush Walking Clubs (Mr. Atkinson) told a gathering of bushwalkers and city visitors that the Minister for Lands (Mr. Buttenshaw) had established a new south coastpark of 1300 acres. It is to be known as the Garawarra Primitive Area Park. The place where yesterday's meeting was held is named Bulge Lookout. It stands 949 feet above sea level, and is immediately above one of the only two palm jungles on the New South Wales coast. "It is the best patch of jungle that I know," said Mr. M. J. Dunphy, an enthusiastic bush-walker. Views of great beauty can be had from vantage points only a few yards from the trail along which more than 200 bushwalkers tramped yesterday. Black gin range is the local name of the mountain or high plateau. Splendid timber still crowns the sheltered highlands. Giant blackbutts, turpentines, grey gums, red gums, she oaks, grass trees, and other sturdy native trees, are still in possession of the lands. "The bushwalkers and their friends will do their utmost to hold Garawarra as it is to-day," said Mr. J. V. Turner, one of the committee of control. Dr. J. S. Purdy congratulated the organisation on its new park. Dr. C. E. W. Bean spoke on behalf of the Parks and Playgrounds Movement. Fifteen years ago a small body of bush-lovers calling themselves the Mountain Trails Club started an agitation to secure for the people for all time an area of about 5000 acres extending from the National Park boundary at Garie to Otford, on the South Coast. Their first suggestion to the Minister for Lands was that it should be tacked on to the National Park; but the authorities considered his pro-position was unfavourable owing to the large amount of privately owned land in the pro-posed reserve and the costliness of the resumptions. This decision did not damp the ardour of the "trailers," and, as time went on, other clubs were formed, such as the Bush Walkers, the Bush Tracks Club, the Bush Landers, the Boy Scouts, and the Girl Guides. Then followed the hiking craze, when many thousands of young people tramped the area from north to south and east to west at week-ends. Hiking clubs were inaugurated, and about two years ago the Federation of Bush Walking Clubs became established. The agitation for the dedication of the Garawarra area was renewed with extra vigour with the result that the Lands Department agreed to set apart 1300 acres adjoining the National Park boundary from Garie to the Palm jungle on the coast to near Werrong or Hell Hole. As the map plan printed on this page shows, the bush land set apart is of irregular shape, the boundary skirting freehold and leasehold land. A great deal of credit for the success of the movement is due to Messrs. Myles J. Dunphy, W. J. H. Roots, J. V. Turner and B. Atkinson, supported by the 10 affiliated walking clubs. Their efforts were ceaseless and while disappointed that the dedicated area is so comparatively small, the hope is expressed that before many years are passed Garawarra Primitive Park will become more than double its present size. The thanks are also due to the Minister for Lands for his sympathetic help and his determination to preserve for recreation this portion of the remarkable scenic forest jungle and beach attractions. It is interesting to record that in the detailed map of Garawarra Park, Mr. Dunphy's name has been perpetuated. The area takes in Mount Bulgo, which is 949 feet above sea level, and from where a wonderful vista of the coastline is obtained as well as "The Palm Jungle" and "Burning Palms." Cabbage tree palms, blackbutts, turpentines, myrtles, other native trees, and wild flowers grow in abundance, from the hill tops to the coastal rain forest. Every effort will be made to preserve these so that this walkers' paradise shall remain in its primitive state, not for the bush-lovers alone but for the far greater needs of pos-terity. Garawarra is derived from two words of native origin, viz., "Gara" or "Geera," meaning "long," and "Warra,' "mountain." In giving the new park this name, the intention was to harmonise with the names of the localities of Illawarra and Cambewarra, thus embracing the whole of the South Coast from the National Park to Jervis Bay. The Lure of Strange Roads. I never come to a strange road but that I want to follow It. And was there ever one that did not reward me? I know an old farmhouse tucked away under the brow of a hill where one can dream the world away. I know another, an old grey mountain home within fifty miles of Sydney, where one will only know the silence of the lonely hills and peace and rest. Come many wonderful things to the hiker of the roads Often my mind dwells upon sunrises and sunsets as I saw them from some "magic casement" on the road; of a moonlit night on Brisbane Water I can muse by the hour. For ever impressed upon my mind is the springtime song of the harvest bird, sung over quiet fields, Lying awake at night on lonely shores I have caught the sound of water birds calling far away in the swamplands. Gazing into the sky I have glimpsed the fleeting forms of wild ducks flying across the face of the moon-a weird and eerie scene. Tramping along wild shores I have breathed of winds that have blown across leagues of space, drinking gladly of the health that was In them. What mattered if the sudden gust pummelled me with playful buffet, or lifted and cast my hat abroad upon the meadows If the winds have retarded my footsteps to-day, driven me back, halted me, and pummelled me, to-morrow they will follow In my wake, helping me along. The sun did not always shine. There were days of cloud and storm. On one such day I camped under an old bridge, and I remember the proffer of a kindly farmer on the Monaro to come in and accept the shelter of his home. For such things as these it is good to be a hiker at times. With the carrying of one's pack one learns freedom and how full the world is of good and kindly people. Report collation and Pictures by A J Guesdon, 2014. Copyright Somerville Family, 2014.